AzBaja.com, Home of the VW Baja Bug -:- Baja Forums -:- VW Volkswagen Bug, Baja, Bus, Sandrail and Thing -:- VW Volkswagen & Baja Bug General Discussion -:- Baja tow bar ?? Baja Forums -:- VW Volkswagen Bug, Baja, Bus, Sandrail and Thing -:- VW Volkswagen & Baja Bug General Discussion -:- Baja tow bar ?? Post subject: Baja tow bar ?? 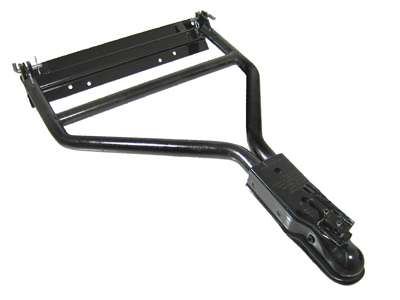 Post subject: Re: Baja tow bar ?? you can extend the tow bar by cutting and welding longer tubes in. an adjustable? hmm like anything that can be made longer or shorter its not very strong. and the bumper idea it would work but i like my baja to be secured and a chinese made front bumper is not the best of quality if you know what i mean. i pull my front bumper off to put my tow bar on, just becuase i like it to be secured to the beam. sometimes the extra work is worth it, to make sure your goods are secured. thats my two cents i hope it gives or points you in the right direction. oh and congrats on the bug there a blast. first off let me say welcome. im new to bajas also but you will learn real fast. the guys here are great. as far as your tow bar goes your kinda stuck. you can redo it like the guy above said but if your going to do that i would just make a whole new one with the part that connects to the beam...or lift your bug!!! I don't think I'd cut off the crossbar. It could really weaken it and might fail when subjected to lateral forces going around corners and whatnot. Maybe you could move the crossbar farther back towards the beam or fab a U-shaped one on that would clear your bumper?